The Royal Greenwich Hospital was founded in 1694, when Queen Mary donated part of the royal estate at Greenwich as a house for pensioned seamen and marines. The foundation stone was laid in 1696 and the first pensioners were admitted in 1705. In 1716 the forfeited estates of Lord Derwentwater were added to the hospital's endowments. In addition to live-in pensioners, the hospital also administered to out-pensioners, with a pension and allowance scheme for widows and orphans of seamen and marines. A school for the sons of seamen was attached to the hospital building. In 1939 this school absorbed the Royal Naval Asylum for the children of seamen. 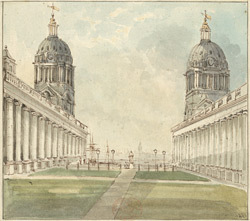 The hospital ceased to house in-pensioners in 1869, and in 1873 the building became the home of the Royal Naval College. The hospital continued to administer the school, which moved to Holbrook in 1933, and continued to provide out-pensioners with financial support.